Huzoor said: Allah the Exalted has explained to us in the Holy Qur’an the significance and status of the Holy Qur’an, the need to put it in practice, how to put it in practice, for whom is the Qur’an a life-giving source, what effects it has on human life and many other countless matters. This is so that not only we may put this great law-bearing Book in practice to facilitate our spiritual, religious and moral development, but also our worldly progress. In the verse that I have just recited, the blessings of the month of Ramadan have been linked to the Holy Qur’an and thus a connection has been established. By connecting Ramadan to the Holy Qur’an the significance of Ramadan has been further highlighted. Hazrat Khalifatul Masih III (may Allah have mercy on him) used to say that a Pakistani minister went on a tour of China in the days of Mao Tse-tung. He asked Mao why he brought about a revolution in his nation. Mao replied why do you ask me, go and observe the model of your Prophet and read your Qur’an and practice it and you will find everything! Thus even others who have understanding, whether they accept it or not, see a light in the Holy Qur’an. ‘Be alert all the time and do not take a single step contrary to Divine teaching and the guidance of the Qur’an. I tell you truly that anyone who evades the least one of the 700 commandments of the Qur’an, shuts upon himself the door of salvation. The ways of true and perfect salvation have been opened by the Qur’an and all the rest is its reflection. Therefore, study the Qur’an with care and hold it very dear with a love that you have not for anything else. As God has said to me: ‘All good is contained in the Qur’an’. This is wholly true. Those people are to be pitied who prefer anything else to it. The fountainhead of all your prosperity and salvation is the Holy Qur’an. There is no religious need of yours which is not filled by the Qur’an. On the Day of Judgement, the Qur’an will confirm or deny your faith’. It alone will corroborate or deny the state of one’s faith. Hadith also relate that it should be recited well. I will lead two funeral Prayers after Salat, one of them is present. Our Kaleem Wassem Sahib, who was a MTA worker, passed away on 6 July of a heart attack at the age of 54. Inna lillahe wa inna illaihi raji’oon. He was the paternal grandson of Hazrat Haji Muhammad Din Sahib, Dervish of Qadian and was the maternal grandson of Syed Sadiq Ali Sahib of Saharanpur and the son-in-law of Mubarak Saqi Sahib who was a missionary here and was also additional Wakilul Tabsheer. Kaleem Sahib was an active member of Jama’at from childhood. During his time in Karachi he was a member of the local and district amila and in Abu Dhabi, he served as Naib Sadr of Jama’at. He immigrated to the UK in 1989 and served as qaid majlis of London region. He also served in finance and Khidmat e Khalq departments and also served during Jalsa Salana. With the inception of MTA in 1997 he was one of its early workers and worked in maintenance and technical fields and also served in other departments. He was currently in-charge of translation and thus served in MTA till his last breath. He was also one of the early MTA news readers and presenters. He had great love for Khilafat and worked with honesty and had a very affectionate relationship with his staff and respected them. His elderly mother is living. He has left behind his wife, Sarah Waseem Sahiba, two sons and one daughter. His mother says that he had great regard and respect for his parents and was very caring towards them and served them very well. He was very caring towards his siblings. His wife says that she observed that her husband had a real spirit to serve and was ever ready to serve the religion of God Almighty. Whatever task was entrusted to him by Khilafat he would try to undertake it with great passion, enthusiasm and cheerfulness. He had perfect belief that Allah the Exalted provides for everyone and also assured others to trust in Allah when doing something or pray to Him. Hospitality was his great attribute and he was most hospitable towards guests at home, in fact he would invite people over. His sister has written that he did not have even a hint of pretence and one of his qualities was that he read books of the Promised Messiah (on whom be peace) as she had often observed. One of his workers Asim Shehzad writes that he worked with Kaleem Sahiob for eleven years at MTA and found him honest and sincere and a true devotee of Khilafat. In his capacity as a senior worker he never let the junior workers feel his seniority and dealt with them with warmth and affection as he trained them for work. Once he saw Kaleem Sahib cleaning the MTA complex at Baitul Futuh and asked him why he was cleaning himself, he should get others to do it. Kaleem Sahib told him very proudly that when the complex was inaugurated, one of the advice I gave to the workers , the advice of the Khalifa of the time, was a particular advice about cleaning and when I was giving this advice I was looking towards him, therefore he understood the instruction to be foremost for him and did the cleaning himself. Once he was viewing old MTA clips of slides of extracts of the Promised Messiah (on whom be peace) and the Khulafa which purported that MTA is an organisation which is playing a large role in furthering the mission of the Promised Messiah (on whom be peace). While watching these clips he started weeping uncontrollably and said how fortunate is Kaleem to be enabled by Allah the Exalted to be working at MTA. Once his leave was due and he applied for leave but Ata ul Mujeeb Rashed Sahib said to him not to take leave at that time as there was a lot of work load. He promptly took back his application for leave and tore it up. Ata ul Mujeeb Rashed Sahib has also written to me that he tore up the application most cheerfully and not in annoyance. Imam Sahib also writes that MashaAllah he was enabled to serve with love and sincerity and also gave precedence to Jama’at work to personal interests. He was an expert in his field and worked with great penchant. Khalid Sahib has also written that whenever during the time of Ravil Sahib who was available at odd hours Kaleem Sahib was approached, he always said that it did not matter, whenever Ravil Sahib was free to come he should come, whether it was night or day. He only asked to be informed in advance so that he could make the preparations. He was ever ready to serve. I have also observed that whenever he came for mulaqat with his children, he would sit his children in the front and took the back seat himself. 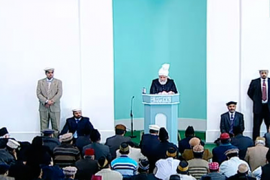 Perhaps to ensure the children spoke directly to me and the connection that he had with Khilafat would pass onto their children. May Allah ever fulfil his desire and his children remain connected to Khilafat. Both the mother and father have brought up their children in a very fine way, MashaAllah. May Allah always keep the children as useful members of Jama’at and be their Helper and may He grant patience and steadfastness to his wife and also his mother. The other funeral is of Al Haaj Asim Zaki Bashir ud Din Sahib of USA which will be in absentia; the first funeral will be present. He passed away on 22 June 2014 after suffering from cancer for a few years during which time he did not ever show any sign of despondency. He fought his battle with illness with great courage and patience. He was born to a Christian family on 26 May 1929 and was drawn to religion from childhood. He was introduced to Ahmadiyyat through personal study and interest and with the grace of Allah the Exalted accepted Ahmadiyyat at the age of 19 or 20. He had resolute belief in the existence of God Almighty and had very strong faith. He was a very patient and grateful person; an embodiment of a true believer. He met many elders of the Jama’at and it was in 1940 when he first met Chaudhry Zafrulla Khan Sahib. He had the honour to meet Hazrat Khalifatul Masih III (may Allah have mercy on him). Asim Sahib said during his first mulaqat with Hazrat Khalifatul Masih III (may Allah have mercy on him) he felt as if he had a halo of light around him; he said he could still picture it. He was enabled to serve in the national amila of USA and was also a local Sadr as well as Tabligh secretary and also served as Zaim Ansarullah. He worked at the port in Seattle, USA for which he had to be away from home for two to three months. His job was well paid but once Jalsa fell during his working days and he left work to attend Jalsa. He always participated in Jama’at programmes. Once he was speeding as he drove to some Jama’at work and police stopped him. He had his prayer cap on so the police asked him if he was going to church, meaning the mosque as he wore a Muslim prayer cap. He said yes he was. The police officer happened to be a good person he told him that he could go but asked him to donate the penalty that he was going to charge him to the mosque. As soon as he reached the mosque he very honestly paid $85, the penalty amount, as chanda. When the Seattle mosque was built he was the highest contributor towards it. This was in 1970 and it was said that his donation amount could have bought a new car at the time. He was very fond of Tabligh and always kept a folding table, some books and flyers in his car. Wherever he went he would set up stall and do Tabligh and distribute literature. He had Jama’at publications and flyer placed in the public library in Seattle. He was concerned about the progress of Jama’at till his last breath. He had great love for the Jama’at and for Khilafat and always advised people to serve the Jama’at. He leaves behind his wife and four children. May Allah the Exalted elevate his station and also enable his children to stay firm on piety.